When we got back after the winter break, we found a twitter message from our Kindergarten twitter buddies in Canada, thanking us for the Japanese New Year cards we had sent. We responded by sharing some exciting New Year news: we had a new student called Nathan. KinderPals tweeted back. It turns out that they have a Nathan in their class as well! 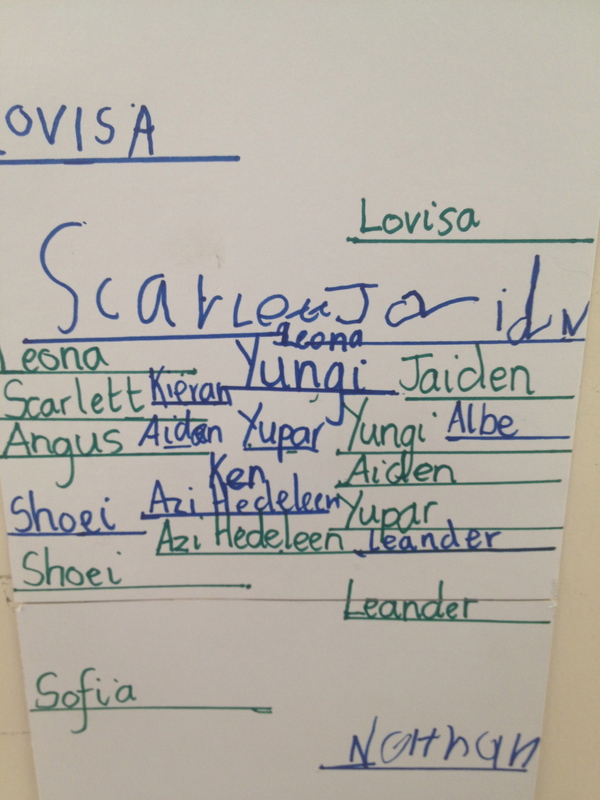 Since the beginning of the year we have been recording the children’s height using lines on a class height chart. As we looked at the height chart a conversation developed about how tall the KinderPal’s Nathan was. Several of the children thought that the two Nathans would be the same height because they were both called Nathan. Other children disagreed. 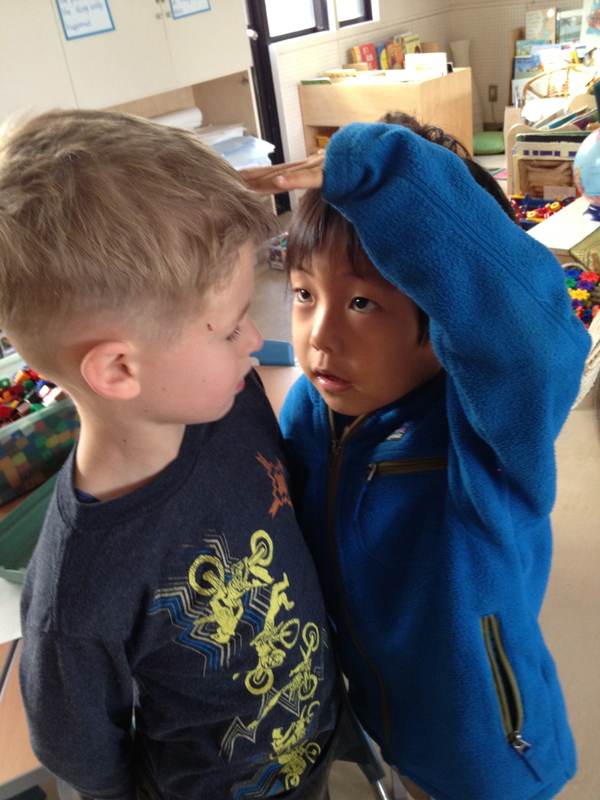 The KC children tweeted KinderPals to ask them how tall their Nathan was. Michelle, the KinderPals teacher, and I emailed each other to see how we could extend this naturally arising exploration into measurement. I was keen to support the student initiated inquiry by ensuring that the children had the time and resources they needed and by facilitating discussions but I didn’t want to give too much guidance on how to measure; I wanted to see what tools and strategies the children would come up with and what they already knew about measurement. KinderPals tweeted us a picture of their Nathan and said that he was 66 cubes tall. Shoei wanted to have a turn. There were only two red pencils left so he decided to measure Nathan using orange pencils. Nathan was 8 orange pencils long. Now we had a problem- was Nathan 14 pencils or 8 pencils long? Lovisa decided to solve the problem by measuring Nathan one last time. She got the yellow pencils and carefully laid them out. Oh oh! Nathan was 11 yellow pencils long! I asked the children what answer we should tweet to KinderPals. Some children thought we should tweet all answers. Others thought we should choose the biggest answer. One person thought we should tweet the yellow answer as yellow was her favorite color. After much discussion, the children reached a consensus that we should tweet all three answers and explain that one was short, one was a little bit long and one was the longest. Scarlett suggested that we needed to mention “One what? They need to know what the thing is, like a pencil“. She was out-voted. I was tempted to step in and agree with Scarlett but I decided not to interfere at this stage but to wait instead to see how the inquiry unfolded; finding out for oneself is a much more powerful learning experience than being told. The KC children were delighted with their work. I wondered what KinderPals would make of this information. I looked forward to seeing how they responded and where this inquiry would go next. The next day we got a reply from KinderPals saying they needed more information. Hmmm! More information! We wondered what information we could give KinderPals so they could know how tall KC Nathan was. Scarlett: That’s what I said but no-one was listening! Because how will they know what we used? At this point I chose to interject and ask the children whether they thought the color of the pencils was important information that would help KinderPals. After some discussion the children reached a consensus that this was not necessary information. Together we composed a reply to KinderPals explaining that we used coloring pencils. KinderPals already told us their Nathan is 66 cubes tall. Which is taller -11 middle pencils or 66 cubes? We tweeted KinderPals back and ask them if they could please measure their Nathan in middle pencils so we could compare the heights. Scarlett suggested that we could measure our Nathan in cubes. There was a buzz of agreement and the children searched around for some cubes. Oh oh! We have several different sizes of cubes. The children shared all kinds of ideas about which cubes we should use. Scarlett suggested that we need to use the same cube that the KinderPals used to measure their Nathan, otherwise “it’s going to be the same problem all over again“. There was not a lot of support for her idea. That told me the children needed more time to explore measurement using non-standard units. 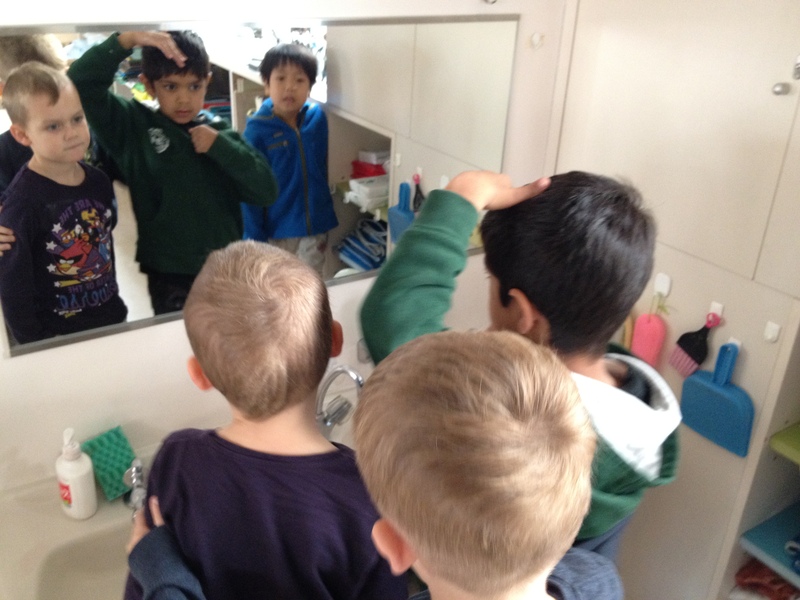 Having measured Nathan, many of the children were keen to measure their own height. I assigned the children partners, taking into consideration the personalities and developmental levels of the children. Apart from that, I did not to give any guidance but stepped back to observe how the children approached the measuring project over the following days. I noticed that many of the children know a lot about measurement already; many children understand the need to start at the bottom and continue to the top and see the need for accuracy; most children know that the measurement needs to be taken in a straight line, with no gaps; some children measured using lengths of paper or wool and then realized that they don’t have a way to communicate the length of their wool -they are discovering that a measurement must have a numerical value. Some children realize that their “number” will have to be greater or less than their partner’s depending on their height and develop strategies for checking the accuracy of their measuring. How can Yungi be 200,000 and Angus is only 5? That can’t be right! I noticed that Aiden has two different highs, 45 and 65. No, how can he grow from yesterday? I think we measured wrong. Yeah, I think there was a muddle. It’s a bit tricky because it keeps changing. And Angus has two as well! 107 and 5. Huh? That’s because I was 107 unifix cubes and 5 meters when I measured with books. 5! I already said! 5 meters means 5 books. Well we had a problem because Nathan is really smaller than me but when we measured the first time he had more than me because he had more than 100. Yeah, that happened to us and we had to measure again. I think the problem is everyone is measuring with different things. That’s why we all have different answers. Because a cube is smaller than a book so you have to be more cubes. That’s why it’s so tricky. I agree! It’s so confusing. From this conversation I conclude that the children are now ready to start exploring measurement with standardized units. As I reflect on the inquiry I think about how important it is to have the flexibility to follow student interests and respond to student initiated inquiries. Just over a year ago I wrote a post about a measuring inquiry, also initiated by a student. That inquiry unfolded in a different way but the learning outcomes of my school curriculum were covered in both cases. In both cases the context, purpose and audience enabled the children to develop strong personal, emotional connections to the inquiry which made their learning more powerful. This inquiry has confirmed once more my belief that if I trust the children and follow them where they want to go, the learning will be deep and rich and we will cover the learning outcomes on the way. Thanks Lynne. It was fascinating to see the strategies the children used to measure and to listen to them explaining their thinking, and to see how the children’s schemas changed to accommodate new information and understandings. Wonderful. Thanks so much for writing this up and sharing it. 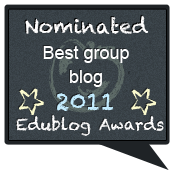 Lucky children – great teaching and learning. So exciting to think about all your students learned along the way. I’m quite amazed at your ability to stand back and let it happen. Your students are very lucky! Hi Jan! I am fortunate to be working in a system that understands the value of giving learners time to find out for themselves. I find it intriguing how inquiries unfold so differently year to year, driven by the particular energy of each group of children. Wow. Reading this both excites and exhausts me. I take for granted so much of what your students learned in this lesson, and yet as a high school teacher I sometimes encounter students who have not yet fully internalized those mental skills.